Looking for the very best in modern painting? Sir Robin Knox-Johnston would agree You have found one here. 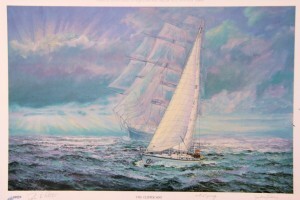 Available as a signed limited edition print, original commissioned and owned by Sir Robin Knox-Johnston. 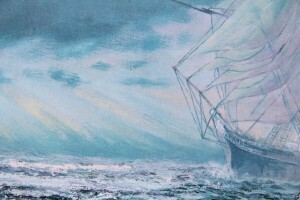 Measuring 51 x 76 cm (20″ x 30″), the original, a fine marine painting commissioned by Sir Robin Knox-Johnston from Gordon Frickers. Here, we see a sturdy new Clipper Class yacht on course with the ghost of the famous tea clipper “Thermopylae”. Designed with and for Sir Robin Knox-Johnston to celebrate the first ‘Clipper Way Round the World Race”, and as a souvenir print for crew to purchase, this was my third ‘Gordon Frickers’ painting for Robin. As part of the process to develop this idea Robin arranged a day for me sailing with and around the Clipper Class yachts while they prepared to depart. Also available, two remaining large, made in preperation for this painting, exquisite drawings in pencil and charcoal, of the Clipper Class Yachts. See also the superb drawings Clipper Class Yachts study 1 being one of a series of 3 studies. This picture is the one chosen of 2 specially produced (the other, The Clipper Way 2, is available) for the Clipper Venture / Times Clipper 2000 crews & their followers. The 60-foot Clipper Class yachts were specially designed for this very long distance race which followed the course of the now legendary racing clippers of the 19 th century, the race was conceived and is run by Sir Robin Knox-Johnston. 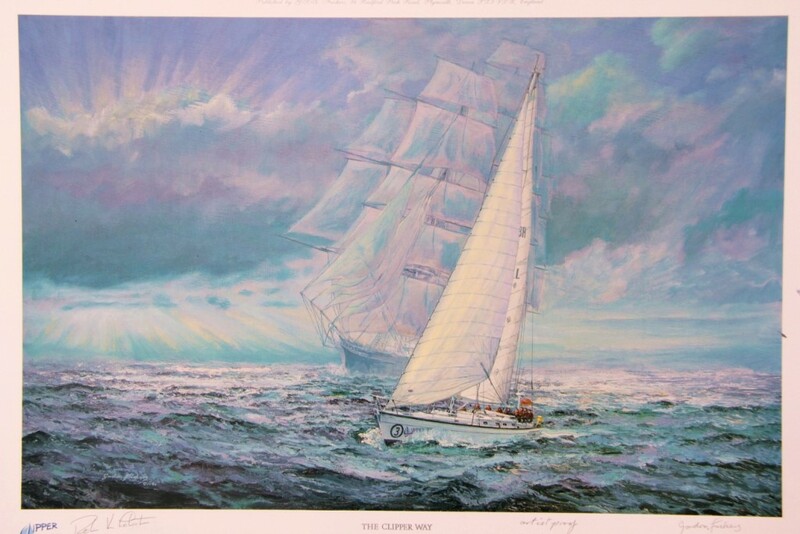 The beautiful marine print is a numbered edition co signed by Gordon Frickers & Britain’s most distinguished and famous yachtsman Sir Robin Knox-Johnston. A distinctive & unique memento of these very special races. It may be easier, cheaper, than you imagine, talking is free and fun and I give you an unrivalled guarantee, phone or email today.